Use it with your computer to talk to friends over Skype. For example, if you hook your PC to your big screen TV in your living room, you can now sit back in your sofa, point & click on your contacts, and quietly talk to your friends. No need to shout at the PC from across the room, and the microphone is only "on" when you press the Mic button. Speech recognition has come a long way in recent years. Used alone, speech recognition can admittedly be a bit dicey at times, but together with the iWavit DirectPointing and wireless keyboard capabilities, you now have an excellent set of tools to interact naturally with your Computer. For example, Dragon NaturallySpeaking Home speech recognition software lets you interact with your PC just by talking. It understands what you say and how you say it. Speak words and they appear on the screen � three times faster than typing. Tell your PC what to do and it does it. Also, Windows 7 has a very respectable speech recognition engine in the OS. You can very quickly get up and going with commands like "Open Internet Explorer", "Close that" etc. Some PCs have sound cards which enable direct pass-though of sound from the microphone to the speakers. This means that you can set up a cheap and simple PA system (Public Address System) in seconds. Check out this video example on how that is done. There is a microphone and a 2.4 GHz radio built into the iWavit Attachment. These are separate from the ones that are in the iPhone. The iWavit can consequently communicate directly with the iWavit USB dongle with very low latency and zero set-up time. Setup is trivial. Plug the iWavit USB dongle into your computer and it will automatically get recognized as a USB Microphone. It is Plug & Play, with no separate driver installation or WiFi network adjustments needed. To use the microphone you need to open an iWavit app which includes a microphone button, such as the iWavit TalknPoint app shown here to the right. 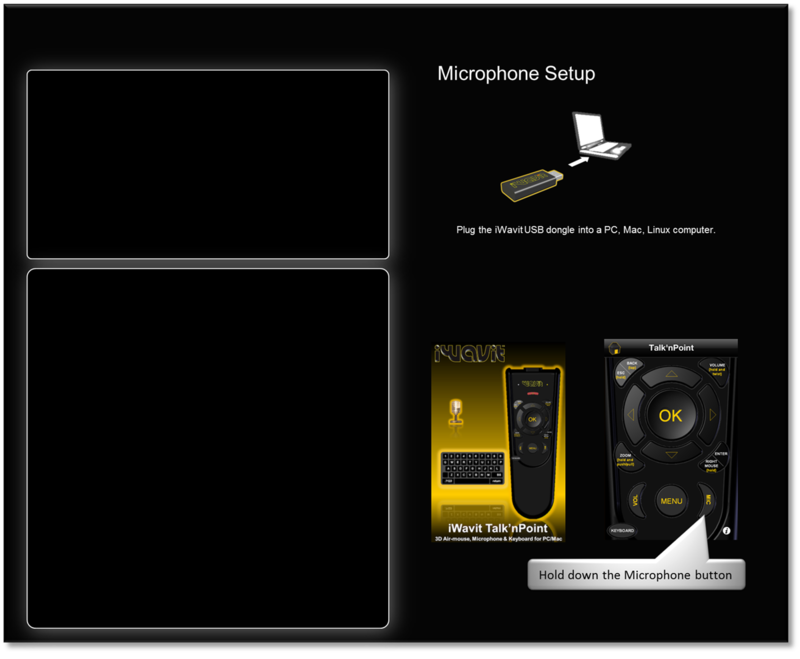 When you hold down the MIC button, your voice will be sent wirelessly to the PC.